" The only clinically and scientifically proven tool and app"
In order to start with a new resolution such as weight loss/fitness plan, the first logical step would be to assess our current health status. You can use this tool to determine your ideal and healthiest body weight. One-click-to health tool can help you determine if you should be considering a meal or fitness plan. 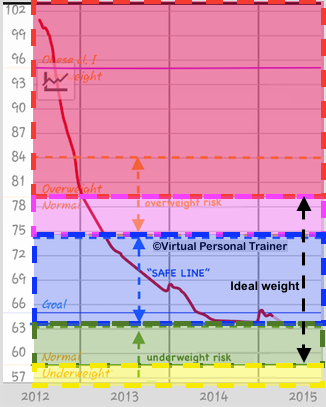 Your BMI, BMR & TDEE, Ideal Weight and Healthiest Area (SAFE LINE in the graphic) measures will give you an idea of your current health status so that you can use this information as starting point for designing your weight loss / fitness plan. The graphic besides shows an interpretation of part of the results generated by the "one-click-to-health" tool. The color schematic shows the predicted current and future health/fitness status for an individual. RED = represents overweight; PINK = overweight probability; BLUE = healthy/fit; GREEN = underweight probability; and YELLOW = underweight. The tool below provides all health measurements and predictions with only one click. It is intended for adult people and should only be used as a guide. Disclaimer: The information produced by this tool is provided for educational purposes only. This information should not be used for the diagnosis or treatment of any health issue. Once we know our health/fitness status, the next obvious step is creating an action plan. Upon using the "one-click-to-health" tool above you will get a link on how to create an action plan that actually works. This 3rd step will be available for all BMI and Weight categories. We encourage you to test by yourself this tool for reaching your healthiest weight and let us know about your experience, your progress and achievements in the comments section below. The results of this experimental program will be presented at international conferences and hopefully published in high impact medical and scientist journals. Your involvement and interaction as well as your contribution is important for us since the information and voluntary donations provided by our followers will be further used for adapting, modifying and improving our programs.